UNIVERSITY PARK — Stasha Carey scored 19 points, Tekia Mack made back-to-back 3-point plays down the stretch and No. 14 Rutgers turned back Penn State, 69-61, on Sunday. The Scarlet Knights (16-4, 8-1 Big Ten) rebounded after their 10-game winning streak was snapped on Wednesday but still had to battle to put away the Nittany Lions (10-10, 3-6). Penn State went more than seven minutes into the second half before making a field goal as Rutgers turned a two-point halftime lead into a 43-30 advantage. 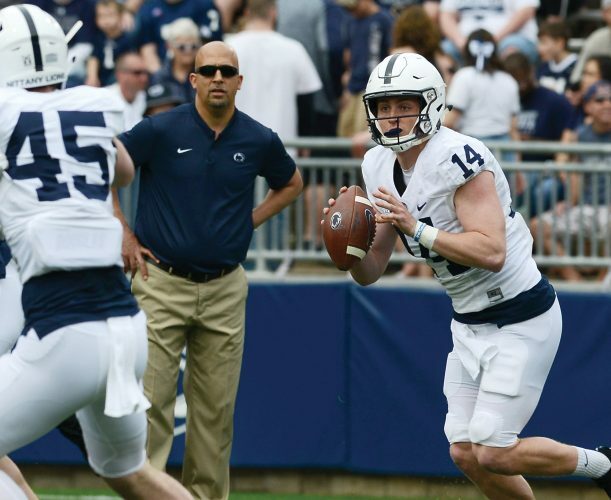 The Nittany Lions cut five points off the lead entering the fourth quarter and got it down to a one-possession game on several occasions. Mack had a 3-point play with 1:39 to go to make it 65-56 and repeated that with 50 seconds remaining for a 68-57 lead. Rutgers shot 56 percent in the second half to finish at 48 percent for the game. Penn State, even with a strong finish of 50 percent in the fourth quarter, shot 31 percent, thanks to an 18 percent first quarter. The Nittany Lions were 22 of 28 from the foul line while Rutgers was just 8 of 11. Teniya Page, the second-leading scorer in the league, had 18 points for Penn State, two below her average. She went 3 of 14 from the field but 11 of 12 from the line and had seven assists. RUTGERS (16-4): Carey 8-16 3-3 19, Harris 2-4 0-0 4, Cryor 4-6 1-2 9, Guirantes 2-9 0-0 4, Wilson 5-9 1-2 14, Gilles 0-1 0-0 0, Jenkins 1-2 1-2 3, Wallace 0-0 0-0 0, Broughton 1-2 0-0 3, Calhoun 1-3 0-0 3, Mack 3-3 2-2 8, Peleg Pelc 1-3 0-0 2, Totals 28-58 8-11 69. PENN ST. (10-10): Smith 1-3 4-6 6, Carter 4-11 3-4 14, Frazier 1-5 0-1 2, Ortiz 0-0 0-0 0, Page 3-14 11-12 18, Ebo 2-5 2-2 6, McDaniel 2-7 2-3 7, Travascio-Green 3-7 0-0 8, Totals 16-52 22-28 61. 3-Point Goals–Rutgers 5-12 (Guirantes 0-1, Wilson 3-5, Broughton 1-2, Calhoun 1-3, Peleg Pelc 0-1), Penn St. 7-21 (Carter 3-8, Frazier 0-1, Page 1-4, McDaniel 1-3, Travascio-Green 2-5). Assists–Rutgers 15 (Cryor 8), Penn St. 12 (Page 7). Fouled Out–None. Rebounds–Rutgers 37 (Carey 7), Penn St. 32 (Ebo 9). Total Fouls–Rutgers 20, Penn St. 15. Technical Fouls–None. A–2,463.